We’d love your help. Let us know what’s wrong with this preview of The Mark by Tim LaHaye. To ask other readers questions about The Mark, please sign up. I am listening to the Mark on audio. Anyone know the money denomination at this point? Compared to the U.S. Dollar. The Mark is the eighth installment in the Left Behind Series. I started this series about a year ago and haven’t regretted it at all. While this is my first endevour with Christian fiction, it is not my first with dystopian. Not being a religious person myself, I was worried coming into it that I would struggle with the context of the story. Luckily, that has not been the case. I find the story to be compelling, interesting and very exciting. They have all been quick reads as well, which is nice The Mark is the eighth installment in the Left Behind Series. I started this series about a year ago and haven’t regretted it at all. While this is my first endevour with Christian fiction, it is not my first with dystopian. Not being a religious person myself, I was worried coming into it that I would struggle with the context of the story. Luckily, that has not been the case. I find the story to be compelling, interesting and very exciting. They have all been quick reads as well, which is nice. Nicolae Carpathia has been resurrected and granted powers by Satan himself. That’s right, people. This is not a drill. The title “antichrist” is official. Due to his belief that he is now God, Carpathia mandates that statues be constructed in his image and that the masses worship those images at least 3 times a day. And he also introduces the Mark of Loyalty which has been prophesied already in the bible. What is the Mark of Loyalty? It’s the Mark of the Beast. One needs to have it in order to trade or buy goods. And if one does not have said mark, they are given the choice of taking the Mark or losing their heads to the “Loyalty Enforcement Facilitator” which is a fancy way of saying guillotine. Obviously the days of accepting other faiths are gone. Our Tribulation Force is forced to go underground if they hope to stay alive to see the Glorious Appearing. We run into some old friends that we thought were dead or serving the antichrist. We find new believers and lose some friends to the cause along the way. The story just continues to roll on and every time you think there’s no way it could get more exciting, it somehow does. Our main core of believers get into these crazy situations but manage to find a way out. Knowing that not all of our faithful believers won’t make it until the end leaves you on the edge of your seat every single time. I think the writers do a great job creating a very believable scenario around the biblical prophesies. The characters get a little more depth each time you encounter them. The shifting perspectives make for a suspsensful reading experience and keeps those pages turning! A re-read - well worth it - has made me go digging in the Bible - if you haven't read the series, some of the stuff in these books look like they are ripped out of today's headline news. Make me think of a line from a song "I wished we'd all been ready"
The Son ha A re-read - well worth it - has made me go digging in the Bible - if you haven't read the series, some of the stuff in these books look like they are ripped out of today's headline news. Make me think of a line from a song "I wished we'd all been ready"
Another reviewer of this book asked "Should Christian Fiction be held to a higher standard?" Yes, it should. "The Mark" reads more like a screenplay than a traditional book. The St. Martin's Guide to writing states that narration and description are needed for almost any type of writing. This book contains very little of either. (Can anyone actually tell at what point Rayford and Albie transitioned from the helicopter to the "fighter jet" in the beginning of the story? And just how did they put Another reviewer of this book asked "Should Christian Fiction be held to a higher standard?" Yes, it should. This book is almost 90% dialogue, and not good/realistic dialogue either. This is "sanitized for children" speech that is so ridiculous it sounds like it came from a 70's B movie. Real people do not speak this way. Real Christians, of which I am one, do not speak to each other as if giving a Sunday morning sermon. Nor do they only and always talk about God/Jesus and/or The Bible. This is screenplay style dialogue that is designed to reinforce the plot of the story, as well as teach the Gospel, but does nothing to present the characters as real, living people. The characters come off as nothing more than cardboard cut outs who are merely mouthpieces for Christian doctrine with no real personalities of their own and are impossible to care about. There is absolutely no description of anyone's surroundings, or anything else for that matter. Outdoor settings are not described, indoor settings are not described, vehicles are mentioned but never described. People are almost never described, and when they are it is so minimally that if you blink you will miss it. I really liked this one! The plot was generally fast and I am so happy about the new believer! Tim LaHaye and Jerry B. Jenkins in their book “The Mark” Book Eight in the Left Behind series published by Tyndale House Publishers tells us The Beast Rules the World. The Bible Book of Revelation tells us, "telling those who dwell on the earth to make an image to the beast who was wounded by the sword and lived. He was granted power to give breath to the image of the beast, that the image of the beast should both speak and cause as many as would not worship the image of the beast to be killed. H Tim LaHaye and Jerry B. Jenkins in their book “The Mark” Book Eight in the Left Behind series published by Tyndale House Publishers tells us The Beast Rules the World. Nicolae, the antichrist, had previously been assassinated but was brought back to life by the devil himself. Nicolae is tightening his grip over the planet erecting statues of himself and demanding that people worship it. He also demands that the people receive a mark that will allow them to do business. Once a person has received the mark they are aligned with the devil and will be going to hell when he is finally sent there. Without this mark a person cannot go anywhere without being questioned, detained and eventually led to the guillotine. "The Mark" leads the reader to the moment where they would have to make a decision on what direction they would take, receive the mark and have no hope of Heaven or not receive it and possibly face the guillotine. It is enough to chill the blood and the scenes in this book will affect you emotionally. Dr. LaHaye and Jerry Jenkins provide a fictional background for the real events that the final book of The Bible, Revelation, speak about: the end times. The Biblical accuracy in“The Markt” is flawless and the story is a page turning thriller. There are wonderful themes: salvation, faith in what you cannot see and who is in charge despite appearances to the contrary. I do not recommend starting this book late at night because it will cost you sleep as you will not want to put it down. Mr. Jenkins is an excellent writer and knows how to twist your nerve endings as he tightens the suspense. I am looking forward to book nine in this series. This book was the 8th installment in the Left Behind Series and by far my favorite and most intense book in the series. Each character in this book have intense and interesting stories to tell. A great continuation to a great series never leaving you with a dull or boring moment. It has been an arduous task, but I've finished Book 8 of Left Behind. The Antichrist has popped back to life after a show-stopping head-wound and has once again taken his place at the world's helm. Everybody is headed toward a mandatory "mark of the beast" (an injected identity chip) and our heroes are trying to figure out how to avoid it. In other news: I love how some guy can basically rule the entire planet, a place that is full of creatures that demonstrably cannot agree on anything, much le It has been an arduous task, but I've finished Book 8 of Left Behind. The Antichrist has popped back to life after a show-stopping head-wound and has once again taken his place at the world's helm. Everybody is headed toward a mandatory "mark of the beast" (an injected identity chip) and our heroes are trying to figure out how to avoid it. I did enjoy reading this book a second time; fortunately, enough time had passed that I honestly did not remember much of it from the first go-around. The cover is kuh-RAY-zee awesome! Probably one of the best parts of the book! hahahah (view spoiler)[I think I just noticed for the first time that the bottom right corner of the "circuit board" on the cover turns into an "angry eyeball"! I do not ever remember noticing that the first time around! Talk about creepy and cool at the same time! (hide I did enjoy reading this book a second time; fortunately, enough time had passed that I honestly did not remember much of it from the first go-around. The cover is kuh-RAY-zee awesome! Probably one of the best parts of the book! hahahah (view spoiler)[I think I just noticed for the first time that the bottom right corner of the "circuit board" on the cover turns into an "angry eyeball"! I do not ever remember noticing that the first time around! Talk about creepy and cool at the same time! (hide spoiler)] An excellent cover! It was a fast read for me, even reading it in my spare time. While it move at a pretty quick pace, it seemed like a lot of dialogue without too much 'description' in it. I sometimes had an image in my mind while reading of what the 'scene' entailed [i.e. - furniture, decorations on the walls, any knickknacks lying around, was it clean or messy, was there a window to look outside, etc. ], but not always. The character development was all right; some previously-introduced characters were killed as new characters were introduced. I thought it as interesting to learn that the previous book, The Indwelling, took place over essentially three days [the same amount of time for Jesus between His crucifixion and resurrection]. I thought that the previous book had taken place in under a week; turns out it was even less time than I had thought. There were some things I really enjoyed in this book. (view spoiler)[The first was Hattie FINALLY becoming a Tribulation Saint! I was very happy with that, as I could not remember what her final disposition was in the series (partly because I last read this book almost twenty years ago, and partly because I never finished the series). A part of me still wished Rayford and Hattie had "finally" hooked up [gotten married] before the end of the series hahahah! We'll see what happens in the next book. Fingers are crossed! (view spoiler)[It is funny, but now it seems like the authors are trying to set up Hannah Palemoon with David Hassid while trying to keep the "sparks" alive between Rayford and Leah with Hattie thrown in to the mix. I enjoyed this book a bit more than some of the others in the series. I found myself starting to like several of the characters including Tsion Ben-Judah, Chaim Rozenzweig, Leah and Zeke. I continued to find the story line fascinating as the prophecies of Scripture unfold. much better writing, but still seems racist and sexist. 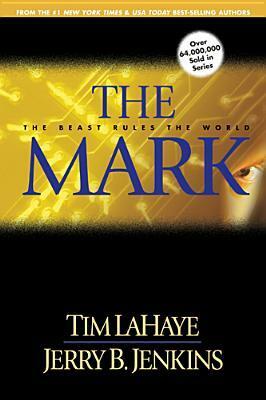 Tim LaHaye and Jerry B. Jenkins came up with a novel idea for their book, "The Mark: The Beast Rules the World." Talk about a prophecy-based fiction. Nicolae Carpathia comes back from the dead, after three days, but now as Satan. His widespread following become known as the Global Community. There is a ant-Nicolae movement afoot called the Tribulation. They are held up in an abandon building in Chicago. Rayford, along with a suspicious colleague jest west on a mission of mercy with electrifying Tim LaHaye and Jerry B. Jenkins came up with a novel idea for their book, "The Mark: The Beast Rules the World." Talk about a prophecy-based fiction. Nicolae Carpathia comes back from the dead, after three days, but now as Satan. His widespread following become known as the Global Community. There is a ant-Nicolae movement afoot called the Tribulation. They are held up in an abandon building in Chicago. Rayford, along with a suspicious colleague jest west on a mission of mercy with electrifying results. Hold on to your seats for the ride of your life. This plot sound so familiar to me, I cannot put my finger on it; however, it was beautifully executed. The characters are well developed as well as the scenes. The dialogue was, sometimes hard to follow; I had to re-read pages just to try to grasp on what was being said and understanding the outcome of the conversation. Oh, I got it. The plot is similar to the resurrection of our Lord and Savior, Jesus Christ. Great, now their taking ideas from the Bible. I'm going to rip the authors and their editor and publisher a new one. Who in their right mind does just left justification for the text of a book? Open any book, go ahead, I'll wait. Open any book to any page and tell me if the text on that page is full justification or not. It was so hard to read this story, because of this. Our eyes are trained to read from left to right; top to bottom. When the right edge is jagged, your eyes want to continue to the edge of the page. Your thought process is jarred; your eyes become confused. Mr. LaHaye, Mr. Jenkins, the publishers at Tyndale House Publishers, Inc., and to the editors: This is a bad practice in which reviews of your books can become detrimental. Stop doing left justification and do full justification. This series just keeps getting better and better. I was glad to see that Rayford is find his natural leader status again. All while I find Buck is becoming a much more main character as he really comes into his own. It sends chills through me to think of being forced to bear the mark of the beast. As an aside, I really enjoying seeing the growth of Kenny, especially with characters like Tsion. That child adds a lighthearted aspect that this story sometimes needs due to the heaviness of the content This series just keeps getting better and better. I was glad to see that Rayford is find his natural leader status again. All while I find Buck is becoming a much more main character as he really comes into his own. An awesome reading for whosoever needs some encouragement in religious fervor. The fun part is that the characters are so likable and the story so well written that you do not need to wholly subscribe to the doctrines and views of Tim LaHaye and Jerry B. Jenkins. If you do, its a plus, but if you don't... expect to suddenly finding yourself digging through your own Bible anyway. This series is absolutely true. Every part creates an impact on your faith and life. Though fiction, it’s Biblical foundation creates an exquisite journey through the tribulation - a peek into the future. My second favorite book of the series as the Mark of the Beast becomes the focus of the Left Behind series. There is so much heartbreak in this book that it was the first novel to ever make me tear up. I loved it. In my opinion this is the best out of the 13 books in the entire series. One of the most suspenseful, you won't be able to put it down. This one is also most touching, and it will get tears out of you. And it will leave you craving more! Sometimes I wonder if given the opportunity, I would give my life for my Lord. So many people did in this book and it seems sad, but they went on to something much better. It gives me something to think about. I didn’t like the violence in this book and I know that’s the point but it was kind of disturbing. I guess that’s the point also. These books are starting to have a feel of unreality.